Notification No. 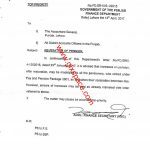 FD.SR-III/4-41/2008 dated 30-01-2015 has been issued by the Finance Department Govt of the Punjab in connection with Payment of Arrear Amount on Restoration of Pension for the Pensioners of the Province of Punjab. 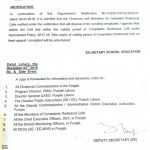 A Complaint Cell, comprising Mr. Rafiq Ahmad, Chief Inspector of Treasuries & Accounts, Government of the Punjab, Finance Department, 4-Lytton Road Lahore and Mr. Muhammad Akhtar, Treasury Officer, Treasury Office, Zila Katchery Lahore is hereby constituted to ensure payments, if, any to eligible petitioner pensioners of the Government of the Punjab in accordance with the judgment of the Honourable Supreme Court of Pakistan reported as Secretary Government of the Punjab Finance Department and 269 other versus M. Ismail Tayer and 269 others (2014 SCMR 1336). Special Thanks to Mr. Humayoun Farooqi for sending the copy of the Notification of Payment of Arrear Amount on Restoration of Pension. My father retired on 19 Aug, 2001( after superannuation of age) from Tehsil Municipal Administration Chiniot as Fire Officer in grade no. 16 as of pay scale of 1994 with 50% commutation for 15 years. As of regulation commutation period will be completed on 19-Aug-2016, will his pension be doubled on this date? While on service he was receiving differen kind of allowance like 25% special allowance(guzara) along with other allowances. Will this 25% allowance also be part of pay/pension? Can you you please answer these questions along with references such as notifications or Punjab Govrnment Orders? my father was retired on 31-12-1999 from Pakistan Railway. 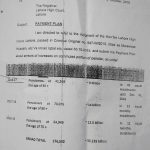 when he said the railway concern about double pension after age of 72 or 75, authority replied that they did not receive any notification under the order of Supreme Court of pakistan. kindly provide the order of supreme court of pakistan in the favor of old age beneficiaries. sir/Mam my mother retired from Punjab Govt prior to 1991.How her pension ad arrears will be calculated. Dear dr attiya rubab I think he is not eligible for pension and commute but the other benefits are eligible. Kindly inform upon what type of class retired people can get benefit from restoration notification.The said notification will be applicable from date of retirement or date of birth. Further retired people who not attained the age upon which double pension is applicable. Can they avail benefit from this notification. Dear M Saeed plz email to Mr. Amir Agha for the detail of the same. Dear Azmat plz email to Mr. Amir Agha for further details. His contact detail is available at this site under the heading "CONTACT US"
My grandfather retired prior to 1991. He worked at GTS . He went to the related office and they said we dnt have any info on this. Then my grandfather went to complain cell and they said ur department will handle it. Kindly help me what should i do. My grand father did have a writ in october 2014. His name is not in this notification list i have the detailed list. There is a news that Punjab government has issued revised notification on 10th February 2015 in which it is stated that all the eligible pensioners will be entitled for restoration arrears.please confirm the news. Dear Babar I have also heard the same news. I ll confirm the same soon. Dear Naveed plz read the recent post at this website. Dear M Javed Khan just email me I ll give the possible detail of the same. 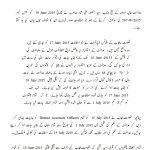 Next date for 20% special allowance case to all the federal government employees is fixed as 02-09-2015 (Monday) in Court No. 4 of Islamabad High Court. Anyone can download cause list from the following link. Dear A. Ghafoor which list? Dear Rizwan plz email me all details with the province or Federal employee. plz tell me the pensioner who retired in 1989 is entitled 7% adhoc relief. it is for all retired employees or for particular employee? Kia hmain court jana peray ga ya ye general order hai. no need of case? Dear Sikandar is Notification main to petitioner pensioners ko benefit ka zikar hay. I have a copy of the orders in which it is mentioned that a decision in favour of an employee will be implemented to all the other employees related to the case even if they are not the part of the case. Dear Miraj I have not the copy of the Notification of KPK but I have heard that the restoration has been done in KPK. I ll try to find the same Notification. madam, where i shall get notification of orderly allowance in KPK. this allowance is not given to education department BPS20. Dear Miraj, I ll try to find the same just send me an email. salam madam. mere abu PRTC se 29-03-1996 ko retire hoe un ki DATE OF BIRTH 30-03-1936 hy. Punjab road transport corporation k yh mulazmeen b in e rears k haqdar hn. mam in k lahore office waly kehty hn k abi raqam ki adaegi ka notification nhi hoa. please madam agr ap kuch bta saken k notification kb hona hy????????? Dear Akhtar yeh Notification ki adaigi ka hi Notification hay. dear madam, 1). 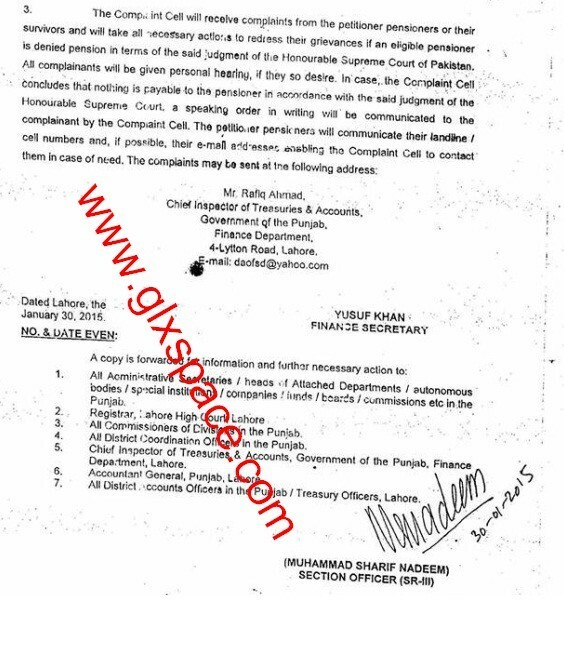 any update about restoration of commuted portion of pension by KPK govt:? any other province have restored commuted portion of pension? 2). 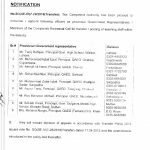 where i shall get notification of orderly allowance in kpk, this allowance is not given to education department BPS 20. Dear Miraj, All the Governments have restored the pension but prior to 01-12-2001 retired employees. 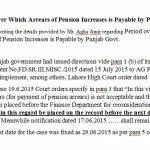 Only the Punjab Govt has restored the pension after 01-12-2001 too.